Christmas Eve: Hanging up his stocking before bed! We started our Christmas Traditions. The ones for Alexander. On Christmas Eve night we dressed him in new Christmas pyjamas, we helped him hang up his stocking and read him 'The Night Before Christmas'. Christmas morning we got up and opened his stocking presents in bed. We came downstairs and surrounded him with his gifts. Infact the presents in the photograph are only about half of what he received; by the time grandparents, aunties and uncles had given too he really was super spoilt. Too much probably; but where is the harm? 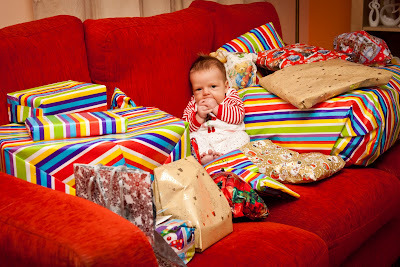 The joy of being able to buy for our baby this year is immeasurable; its no wonder we got a bit carried away. As it turns out Christmas is not yet finished in our house. Alexander has many presents left under the tree to open. He can only cope with 3 or 4 presents at a time before his concentration span has waned and he has had enough. Yes I could open them without him, but I want him to be involved, so we will open them when he happy to sit on my lap and rip paper hand-over-hand; happy to look at each thing he's been given. I want to teach him, even now to appreciate every present. Christmas Morning: Look at all the presents Father Christmas bought for me! His current favourite is definitely his new playmat. 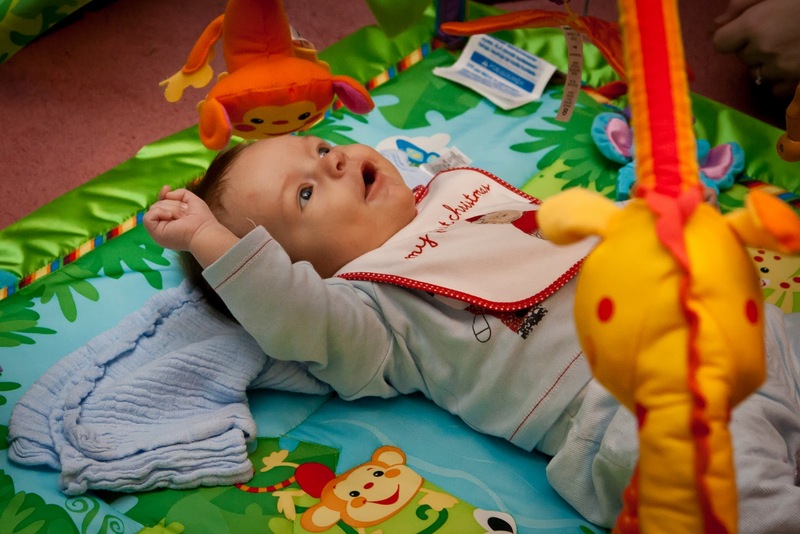 As soon as he was led on it for the first time he was cooing away, flinging his arms and legs around and haphazardly knocking the hanging toys and taking great delight from it. There is so much else left to explore too, when he has finally opened it all. At this rate it could very well be January before we've managed it! Just as well his birthday is 10 months away; I think it will take us until then to play with everything from Christmas! I love my new Jungle Gym Playmat! Happy Christmas beautiful boy; even though you'll never remember it I hope you had a very special day. Despite your mother's mixed emotions; you've no idea how precious you are and how precious it was to be able to spend Christmas this year with you. 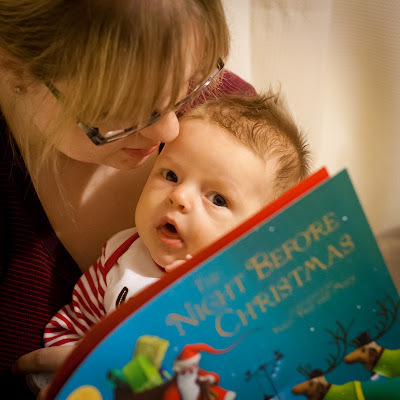 Our baby, on his first Christmas.